For the ancient city on the island of Kasos, see Kasos (city). 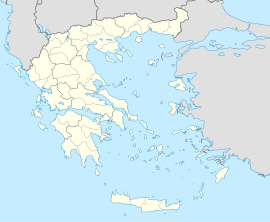 Kasos (/ˈkɑːsoʊs/; Greek: Κάσος, pronounced [ˈka̠so̞s]), also Casos, is a Greek island municipality in the Dodecanese. It is the southernmost island in the Aegean Sea, and is part of the Karpathos regional unit. As of 2011[update], its population was 1084. The island is known in Italian as Caso. Kasos lies southwest of Karpathos, between this island and Crete. Adjacent to the island is the Strait of Kasos, through which some of the Modified Atlantic Water enters the Sea of Crete. Its shape is elliptic and resembles that of Rhodes. The main island has a surface of 49 square kilometres (19 sq mi), and it is 17 km (11 mi) long and 6 km (4 mi) wide. It is very mountainous, its highest mount being Mt. Prionas, which is 550 metres (1,800 feet) high. There is fresh water on the island. The Municipality of Kasos (Δήμος Κάσου) includes several uninhabited offshore islands, the largest of which are Armathia and Makronisi. Its total land area is 69.464 square kilometres (26.820 sq mi). The island has five villages, Fry (pronounced like "free", pop. 357), Agia Marina (444), Panagia (34), Poli (80), and Arvanitochori (169). Fry is the capital and home to the island's harbor, Agia Marina is most populous village. The airport is located close to Fry and is big enough for an ATR 42 to land. Kasos is notable for its lack of large scale tourism, the quality of its fish, cheeses, and other culinary specialties, and its hospitality toward visitors. In ancient times, Kasos (then known as Amphe (Ancient Greek: Ἄμφη), Astrabe (Άστράβη), and, most commonly, Achnis) was used as a safe harbor by the Philistines. The first known settlements are Minoan and Mycenaean in origin. According to Homer (Iliad, 2.676), Kasos contributed ships toward the Trojan War. During Classical Antiquity it closely followed the history of nearby Karpathos. Along with Karpathos, it was subjected from 1306 until 1537 to the Venetian Cornaro family, then belonged to the Ottoman Empire. Kasos took part to the Greek Revolution and supported the cause with its fleet. In 1824, Mehmet Ali Pasha of Egypt, furious with the Kasiots, dispatched his fleet to the island : the Egyptian armada plundered the island, killed 500 people and enslaved 2000, an event described as Kasos massacre. The island's population recovered as did its economy, still largely based on shipping. The introduction of steam ships made Kasos' shipyard (which produced wooden sailing ships) redundant and its economy suffered accordingly. Beginning in the later half of the 19th century, many emigrated from Kasos, initially to Egypt (about 5,000 people), then to Istanbul, Greece, USA and South Africa. By the 1920s, out of about 2,300 houses on the island, only 400 were permanently inhabited. On 12 May 1912, during the Italo-Turkish War of 1911-12, after the so-called "Battle of Cassos" that took place on 29 January 1912, the island was occupied by the sailors of the Regia Marina ship Regina Elena. 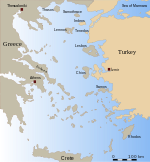 With the Treaty of Lausanne of 1923, Kasos joined the other islands of the Dodecanese in the Italian possession of the Italian Aegean Islands, and was ceded by Italy to Greece with the Paris Peace Treaties of 1947. The island formally joined the Kingdom of Greece on 7 March 1948 together with the other Dodecanese islands. Kassia (revered in the Eastern Orthodox Church as St. Kassiane), a Byzantine abbess, poet, composer, and hymnographer. ^ Peter Saundry, C.Michael Hogan & Steve Baum. 2011. Sea of Crete. Encyclopedia of Earth. Eds.M.Pidwirny & C.J.Cleveland. National Council for Science and Environment. Washington DC. ^ a b Stephanus of Byzantium. Ethnica. s.v. Κάαος. ^ Melas, E.M. (2010-03-12). "MINOAN AND MYCENAEAN SETTLEMENT IN KASOS AND KARPATHOS". Bulletin of the Institute of Classical Studies. 30: 53–61. doi:10.1111/j.2041-5370.1983.tb00435.x. Bertarelli, L.V. (1929). Guida d'Italia, Vol. XVII. Consociazione Turistica Italiana, Milano. . This page was last edited on 12 March 2019, at 00:59 (UTC).